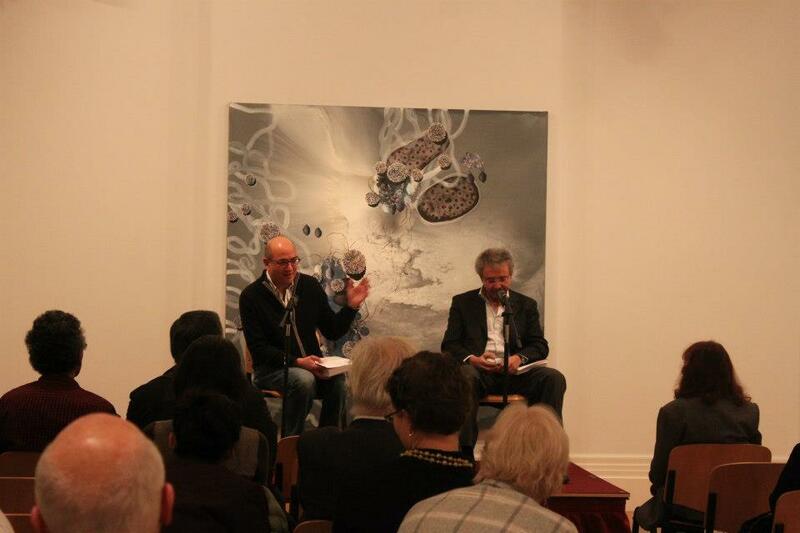 Palestinian novelist Ibrahim Nasrallah launched the English translation of his Time of White Horses at the Mosaic Rooms this past Tuesday. Nasrallah spoke of his project — depicting the epic history of contemporary Palestinian life. Twenty-five years ago, Ibrahim Nasrallah felt compelled to record the history of Palestine for fear that its people would forget. He started his project of a Palestinian tragicomedy, as he puts it, which has so far comprised seven novels set in different locations and with different characters. Time of White Horses, the sixth of these novels, was shortlisted for the International Prize for Arabic Fiction in 2009. It has since been translated by Nancy Roberts and published by the American University in Cairo Press. In a conversation held at the Mosaic Rooms on the 13th of November with Omar Al-Qattan, Nasrallah talked about his project — to depict the epic history of contemporary Palestinian life. He also talked about the experience of being both a novelist and a poet. 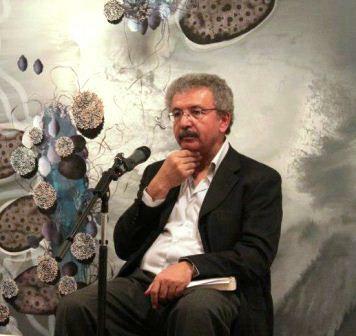 He touched upon readership in the Arab world and the power of the internet to promote books and challenge readers, and he inspired the audience with readings from his novel and one of his recent poems. Ibrahim Nasrallah has written 15 collections of poetry and 15 novels. Time of White Horses, a novel that had been lingering in his mind for 22 years before writing it, tells the story of Palestine from 1875 to 1948, spanning three generations of Palestinians. To write the novel, it was essential that he meet with elders from various villages, with whom he recorded 72 hours of interviews. Though the interviews were not sufficient, and he complemented them with research, they were essential to immerse him into the social and historical mood of a time before he was born. Time of White Horses depicts life in the village of Hadiya. Though it may seem to have some romantic elements, or poetic potential, the life of this village is similar to any other village, where life is organic and the characters are at one with their land and their animals — in this case, horses. When these societies are confronted, says Nasrallah, with the Ottomans or the British for example, they are represented as any society with its different contradictions. There are good characters and bad ones, courageous characters and cowardly ones. Positioning himself with other Palestinian writers? Nasrallah was asked how he would compare himself to Ghassan Kanafani, Emile Habibi or Jabra Ibrahim Jabra. He admitted that the question was daunting, yet though these writers presented great works, “it is difficult for them to be the reference” he says. For when one writes, one is not only influenced and challenged by the writers of one’s own country, because they are not necessarily the universal voice. “How can one neglect other writings?” he asked. As a poet, Nasrallah said, you become concerned with what goes on inside you. As a novelist, you become concerned with what goes on inside you but also with what goes on in the worlds of other people. There is a crossing point between both. He acknowledges that he would not have been able to write some novels had he not been a poet, and vice versa. In other words, he used to fly with just one wing, but now he flies with two. When asked about readership, Nasrallah mentioned that the most difficult thing in the world of writing is to gain the confidence of the reader. When he thinks of writing a book, he thinks about it through the eyes of a reader. What moves him to read a book is whether he, as a reader, would want to read it. He considers himself very lucky because he has a wide readership and more so because the largest proportion of his readers are young people. Time of White Horses is in its seventh Arabic edition and has sold 25,000 copies. According to Nasrallah, the 1990s witnessed a real crisis in the Arab world after the hijacking of the first intifada, the Gulf War and the invasion of Kuwait, which led many people to feel great despair. This was reflected in a collapse in the sales of books in the region. A significant change, however, was noticed in the past five years. Nasrallah believes that the Internet had a strong role to play in this change: “It has helped to increase distribution and has challenged young readers to know more about books and to read more,” he said. One young reader, after reading Time of White Horses, told him “I am Palestinian and I have always been sympathetic with Palestinians, but now you have made me love Palestine.” To him, this statement summed up the purpose of the project on Palestine he had been working on for 25 years. Ultimately, it is to reach this young generation. Ibrahim Nasrallah is not only a poet and novelist, but also a painter and a photographer. This is reflected in his works, which are very picturesque. He was asked whether he had had any success getting his works adapted to television. His response was that he had encountered great difficulty finding an Arab television station willing to produce Time of White Horses. One channel had suggested they change the location; another had recommended it be produced as a Bedouin series, making the subject of Palestine as much under siege in the Arab World as it is internationally. Finally, as another day dawns on the situation in Gaza, the poem that was read at the end of the talk left a heavy mark on the audience. It is entitled Survivors (Najoun) and is taken from Nasrallah’s most recent collection of poems On the Thread of Light. Is it doomsday? Has the wolf made peace with the lamb at last? * Transcribed from a recording. Translator not mentioned at the event. Amira Abd El-Khalek studied English literature and anthropology in Egypt and the UK. She has held academic positions at Ain Shams University and the American University in Cairo and has worked in national and international NGOs. She is an avid reader in English and Arabic, enjoys writing and is passionate about films. Thank you for giving this glimpse about such an author. I guess I have to have my copy now of Time of White Horses.